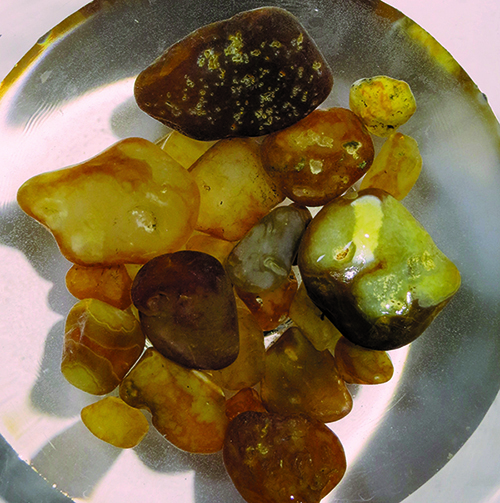 Most of the agates we found on our excursion were carnelian like these. They will be great for tumbling. 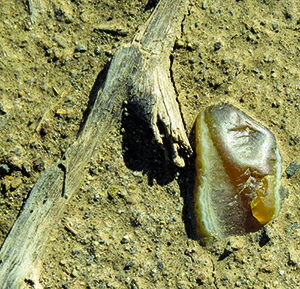 Every locality a rockhound finds or visits has a story to tell. They all hold secrets and offer up clues that can shed light on what can be found at each, where to look, and how they came to be. 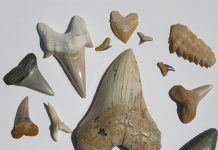 Finding and collecting at new localities can be a much richer experience if one takes the time to get the big picture. Often the hunt starts with rumors, chance encounters, published information, or by checking out displays and dealers at rock shows and talking to fellow rockhounds. I was very fortunate to stumble across something new for me in April of 2018. Johnny gifted me with this killer CBA. The exterior was rather nondescript, but when cut the interior was amazing. A small contingent from the Yakima Washington Rock Club traveled to the Tri-Cities Washington (Richland, Pasco, Kennewick) to pick up a bunch of display cases from the Lakeside Rock Club we needed when we were going to host the Northwest Federation Show in Yakima Washington the last weekend in April. We had scheduled the Federation event for the weekend following the Lakeside Club annual show so the plan was to pick up the needed cases upon completion of the club’s show. We also got there early enough to take in the show and see what they had to offer. While making the rounds of the dealers and displays I stopped in front of a case of agates the likes of which I had never seen before. They were labeled Columbia Basin Agates and some closely resembled high quality Argentine Black River Agates. 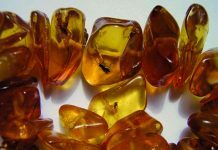 Over the years I had heard rumors of agates being found in the gravels of the ancestral Columbia, Salmon, Clearwater, and Snake River drainages, but thought they were all run of the mill yellow to red carnelian pebbles. The specimens on display in this case were large, well patterned and uniquely colored. I was duly impressed. Being that we were in a hurry to load the display cases I didn’t take time to find out who the case belonged to. As the summer progressed I started to take note of occasional posts and photos in two of the Facebook groups I am a member (Northwest Rockhounds and Agate Collectors Worldwide) by a guy named Ryan King. The photos Ryan was sharing from his collection were of agates he was calling Columbia Basin Agates and they were amazing. I decided to contact Ryan in the fall of this year to see if he might be interested in having me write an article for Rock & Gem magazine that would showcase Columbia Basin Agates and his collection. Much to my delight he answered my query immediately and said he would welcome that and also take me out to one of his collecting areas. During our conversations planning the trip I also found out that the killer display at the Lakeside Club show belonged to Ryan. How cool is that?! Plans were made for us to meet in Pasco Washington on the morning of October 14. The day dawned clear and sunny as my wife Kerry and our two faithful rockhounds Schmenley and Charles piled into our truck and headed out of Yakima Washington. Fall in the Yakima Valley is always a busy time as farmers are in a rush to finish harvesting apples and wine grapes from the thousands of acres devoted to those crops. 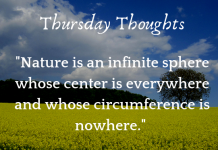 The scent of ripe fruit still on the trees filled the air. As we drove down Interstate 82 toward Pasco Washington we passed many flatbed trucks loaded with full apple bins headed to the storage and processing facilities. We had decided to meet at a McDonalds and when we pulled in Ryan and his rock hunting buddy Johnny Buster were already there waiting for us. Both sported full beards and somewhat reminded me of lumberjacks. They were big guys. We had hardly gotten out of our trucks when Johnny gifted me with a really nice face polished example of one of his Columbia Basin Agates. Generosity like this doesn’t happen very often and I was really pleased to get it. After introductions, grabbing some breakfast, and taking some time getting to know each other we piled into our rigs and headed out to the location Ryan wanted to show us. Because this location is on private land which Ryan has been given exclusive rights to collect I am not at liberty to divulge where it is. When we arrived at the spot we left the highway and started driving through a large vineyard. I continue to be amazed by how much land in the lower Yakima River Valley has been converted to wine grape production. Thousands and thousands of acres stretch to the horizon. The access road we traveled had been paved in a layer of river gravel and cobbles that had been dug from a borrow pit on the property. I had a feeling this was the source for the agates we would be seeking. Sure enough, when we finally parked a large steep walled pit with thick layers of stream laid gravels and cobbles greeted us. The lower talus slopes of the pit were piled deep in smooth water transported cobbles and the head wall of the pit exhibited thick layers of cobbles mixed with gravel and sand. On one side of the pit a basalt formation was exposed and in direct contact with the stream deposits. 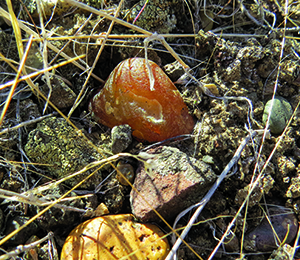 This little carnelian “glowie” was found among the other rocks on the ridge above the quarry. Note the lichens covering the other rocks. As the Yakima River makes its way from tributaries in the Cascade Mountains to where it eventually empties into the Columbia River near Richland Washington, it follows a course that is bounded on both sides of its valley by long rolling sagebrush covered basalt ridges. The south slopes called the Horse Heaven Hills and those on the north called the Rattlesnake Hills have formed over millions of years from tectonic forces emanating from a fault system in Oregon. Long before these ridges formed the whole of central Washington was buried in thousands of feet of basalt lava that originated as repeated eruptions of fluid basalt from fissures on the Oregon/Idaho borders. The lava from these eruptions is similar in makeup and flow behavior to that from the volcanic activity on the big island of Hawaii. When these fissures were active the ancestral Columbia, Salmon, Clearwater, and Snake Rivers coursed far and wide across the landscape carrying sediments from the newly forming Rocky Mountains. Rocks, cobbles, agates, and petrified wood from these stream laid deposits were often buried by pulses of this basalt lava forming a layer cake deposit that has been exposed by erosion of the uplifting ridges. One of these isolated exposures is where Ryan and Johnny had taken us. The rocks and cobbles that make up this deposit are mostly rhyolite and quartzite with minor amounts of basalt. The whole exposure has been tilted upward by the forces that formed the Horse Heaven Hills. In short order we started climbing up the loose material at the headwall of the pit slipping and sliding as we went. I intently scanned the surface looking for anything that resembled an agate. Almost immediately both Ryan and Johnny started finding small high quality yellow and red carnelian agates that they called ‘glowies.’ I asked why they gave them that name and they said when they are hunting into the sun these agates shine with an internal glow making them easier to spot. Unfortunately, we were hunting in the shade of the cliff face making it really hard to discern the little suckers from the rest of the rocks. We made our way along the face of the cut finding occasional agates and then Ryan went back to his rig to fetch a ladder that he propped up on the cliff face so he could get a closer look at the rocks higher up on the wall. Johnny steadied the base of the ladder while Ryan crawled up. Loose rocks and cobbles rained down on both of them. I chose to get out of the way having been beaned by way too many errant missiles on past rock digging expeditions. I know, hard hats should be standard equipment, but it is harder to hear the rocks whispering to me when I wear one. After spending time in the pit we climbed the hill behind the head wall and started looking in the grass and sage where rocks and cobbles were exposed on the surface. Again Ryan and Johnny found several ‘glowies’ and I continued to get skunked. 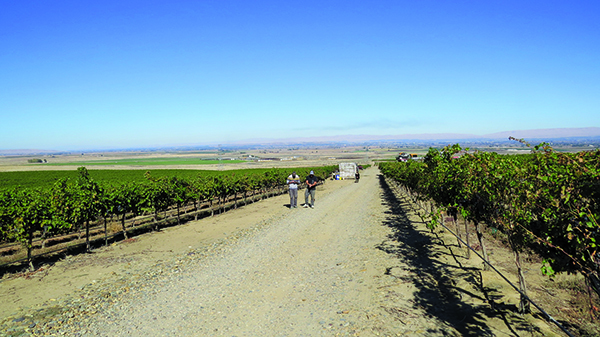 Having covered that area we headed back to our rigs and drove across the highway and down a long graveled road that wound its way through one of the vineyards. We parked on the far end and started walking the road looking for agates. The vineyard road we walked looking for agates had been paved with rocks from the quarry. The sweet smell of ripe wine grapes filled the air. Again, the rock these roads had been paved with had come from the borrow pit we had just visited and yellow and red ‘glowies’ were frequently encountered. I even started finding a few. The agates Ryan and Johnny were really pursuing are different from the carnelian ones. They are kind of a root beer color on the surface and have either internal water level or concentric bands of contrasting colors, mostly white to cream. They are really hard to spot as most of the rocks on the road had the same colors. Ryan said the best time to find them is during or right after a rain. After an hour or so of assuming the rock hunter posture of head down and slow shuffle we decided to head back to the rigs and drive back to Richland to check out the collection Ryan has amassed since 2004, which is when he first started hunting these agates with his dad Eddie. This small and faintly banded “glowie” was found in the gravels next to the highway. As we drove up the road back to the highway I noticed Ryan slowing down and then both he and Johnny poked their heads out of the windows of the truck. These guys were road hunting for agates and spotted some. Unbelievable! My wife Kerry and I had been having difficulty spotting the agates while doing the rock hound shuffle. We were in the presence of greatness. When we arrived at Ryan’s home in West Richland he first showed us some of the petrified wood and other rocks in his collection. He had a large piece of petrified wood that had come from one of the aggregate quarries in the area. He let me take a sample to bring home to thin a section and possibly get an ID for him. Just then hi daughter Layla came bounding out of the house to become daddy’s helper with rock show and tell. For sure she is a budding young rockhoundette. Left: This amazing baseball sized CBA shows the striking banding they can have. Note the quartz crystal center. Middle: I was really impressed with this agate. 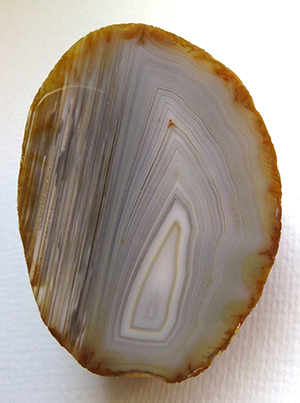 The banding reminded of what some Brazilian agates look like. Right: This CBA Ryan gifted me with has water level banding, agate stalagtite tubes, and a quartz crystal center. Next we went into the house where Ryan introduced us to his wife Alysha and newest member of the family Kane. Layla latched onto Kerry and took her to her room to show off her treasures. I on the other hand was drawn to a display area where Ryan had piled several Columbia Basin Agates that were larger than anything we had found on our trip. One specimen about the size of a tennis ball really attracted my attention. It had water level banding on one end, tube agate stalagtites on the other, and a quartz center. It was a really nice specimen and I was amazed when Ryan gifted it to me when we left. It is a specimen I will cherish. Other CBA’s in this display had concentric bands that somewhat reminded me of Argentine Black River Agates. Next he took me into his man cave display room. He had painted the walls black and had built a really cool display case with subdued lighting and a mirrored back. What he had on display nearly gave me a heart attack. This cut and polished CBA displays both water level and concentric banding. There was row upon row of killer agates of all sizes with some being well over a pound each. They were very different from the carnelian agates we had found on our outing. Their shapes and patterning indicates they may have formed as infillings in gas bubbles in some kind of volcanic rock formation the origin of which is still unknown. I was reminded of stream tumbled agates from the Yellowstone River with the surface pits and pings from frequently banging against other rocks. The Yellowstone agates have been transported hundreds of miles from where they formed when silica solutions seeped into the hollow molds left behind when trees were buried in some kind of pyroclastic flow. These Columbia Basin Agates have also been transported long distances from their source. While they were forming in hollow cavities it looks like the first pulses of silica laid down the parallel bands of water level agate and agate stalagtites that formed the tubes and eyes seen in some of the specimens. Later activity produced the banding, and still later quartz crystal formation in the centers finished the process. That is my best guess from the evidence I have seen so far. The carnelian agates may be something entirely different. Their exterior color that for the most part is just skin deep reminds me of the carnelian that is so abundant in coastal streams in both Washington and Oregon. The color and patterning looks really good on the outside, but when cut it often fades. Did they come from the same formation that produced the CBA’s? Who knows? As we were leaving Ryan gifted me with two more really nice agates. One was polished and the other had been cut to show the internal banding. I was pleased to receive them. So there you have it. We visited a locality that had a great story to tell. There were many clues that helped us discover answers to questions about its secrets. There are still questions that need to be answered and I am sure these questions will lead to endless conversations that are so integral to the rockhounding experience. If you would like to keep up with the doings in the Columbia Basin Agate world consider checking out the following groups on Facebook. Ryan is the site administrator for Columbia Basin Agates (CBA’s) and Columbia Basin Agate Marketplace. Other active groups where Ryan and others post are Northwest Rockhounds and Agate Collectors Worldwide. 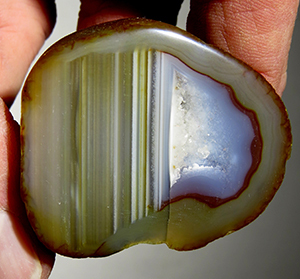 Ryan told me he is really dedicated to getting the word out about these world class agates and is looking to have a book written that will feature Columbia Basin Agates. The enthusiasm he and his rock hunting partner Johnny project is infectious. I would like to thank both of them for taking us out to experience what hunting for these great agates is like. They were a blast to hang out with. I would also like to thank them for gifting me with really nice specimens of Columbia Basin Agates. Such generosity and fellowship makes for great memories. If you would like to learn more about the ancestral streams that transported the Columbia Basin Agates go to Youtube, search for Nick Zentner Lectures and click on Ancient Rivers Of The Pacific Northwest. Nick is on the staff of the Central Washington University Geology Department and has become somewhat of a rock star with his many well researched videos and lectures that cover a wide range of geology related topics from the Pacific Northwest. 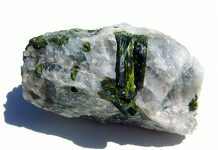 Next articleRocks & Minerals Taking Center Stage in Movies?